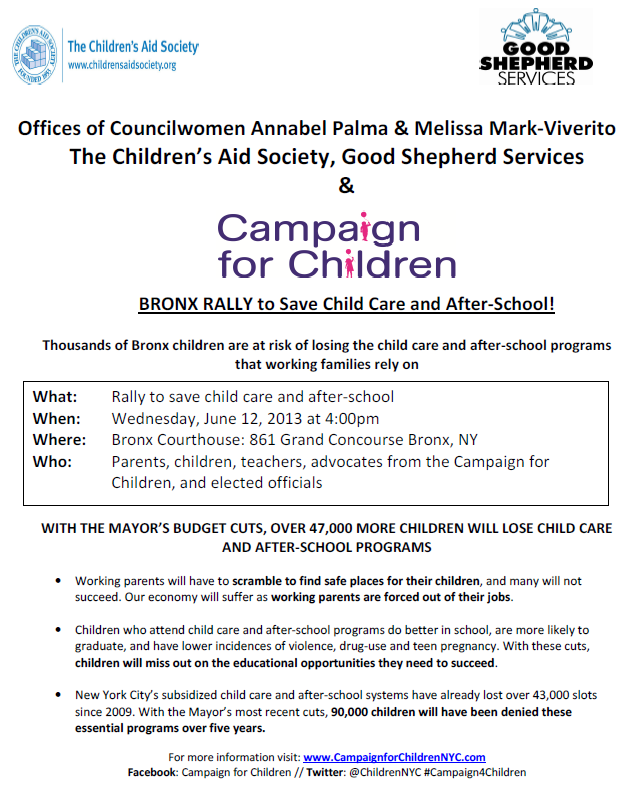 Melissa, along with Council Member Annabel Palma, Campaign for Children, The Children’s Aid Society and Good Shepherd Services will be holding a rally to save child care and after-school services in the Bronx tomorrow, Wednesday, June 12th at 4 PM outside the Bronx courthouse. Because of the Mayor’s budget cuts, over 47,000 more children will lose child care and after-school programs. Click here to read the Campaign for Children’s full report: “NYC is Going Backwards: What the Mayor’s Budget Cuts to Child Care and After-School Mean for New York’s Children and Families.” This budget cut is simply unacceptable – there is too much at stake. This entry was posted in Blog, Citywide, Events, Mott Haven, Take Action! and tagged After-school activity, Bronx, budget cuts, Campaign for Children, Campaign4Children, childcare, children, Children's Aid Society, courthouse, families, family, Good Shepherd Services, rally, youth. Bookmark the permalink.